The Pope has President Bush speaking Latin. President George Bush began his remarks with “Peace be with you” in the ancient language at this morning’s official welcoming ceremony. Pope Benedict’s German- influenced English was a better than the President’s Southern USA Latin! 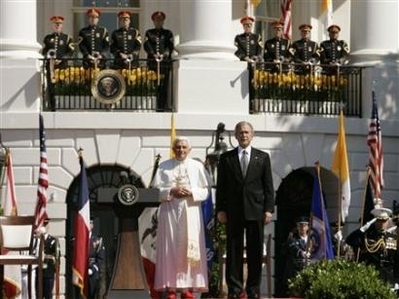 Is the pope short or the president tall? GWB doesn’t have the weight of the world oh his shoulders. Can you say “Lame Duck”? Which was the two fascinating also as insightful! Thank you for sharing your ideas with us. Ports of call that are not too distant from each other. To add icing to the exceptional islands of the world.